Da N00bz are not happy – Nazgrab’s Yella Deff have a couple of their missing lads and their beloved war trukk, Keith. Not for long, or so goes the plan. A daring raid is attempted whilst most of the mob are away from the fort, wish them luck! 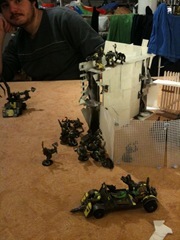 The boyz are out, but some of the older lads are still home, namely Nazgrab, Grimfang and Choppablock. 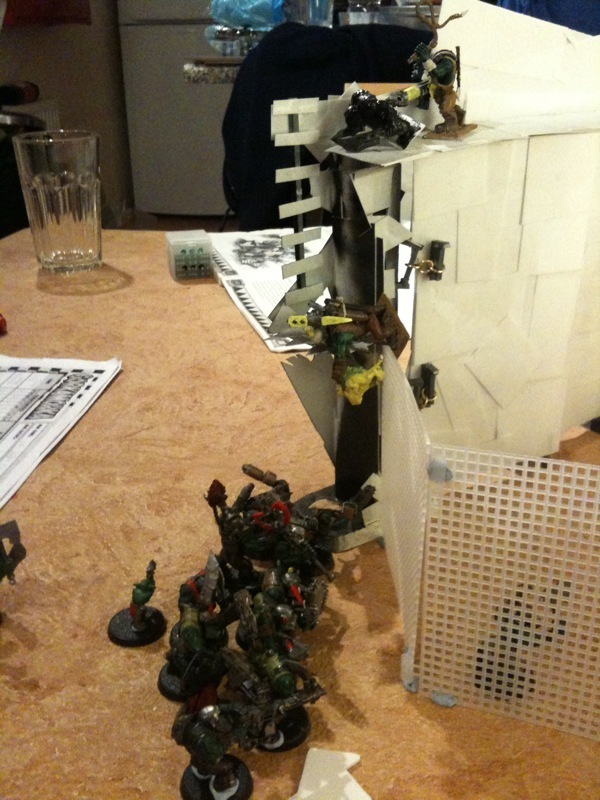 Unfortunately, only Grimfang manages to dodge the hail of gunfire delivered by Da Not So N00bz as they approach the walls. Both Nazgrab and Choppablock go down! Dakka! Dakka! Luckily for Nazgrab, all the commotion was loud enough to be heard by the rest of the mob in a nearby canyon. Rushing back on both Krunch and Grin, the boyz open fire and cut a swathe through the attackers. 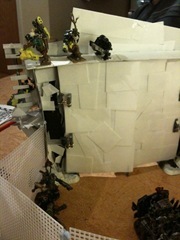 Da Not So N00bz storm the fort, clambering over the walls and freeing their imprisoned comrades. Nazgrab is back on his feet and attempts a jumping charge from the ramparts. 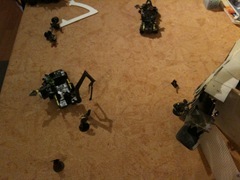 Sadly for him, Eugene has his choppa conveniently waiting for him and the poor Morker nob goes down. Meanwhile, Choppablock and Grimfang join the melee that has broken out at the foot of the walls. It’s not long before a resounding “thud!” is heard as one of the Gorkers takes Choppablock down. Ouch. Excellent use of krak stikkbombz sees Da Not So N00bz blow the bloody doors off and fire up Keith. Nazgrab’s boyz have had enough! They’re offski! Da Not So N00bz reclaim their boyz and their ride, taking a few moments to leave a few “presents” for the fort’s absent residents.. 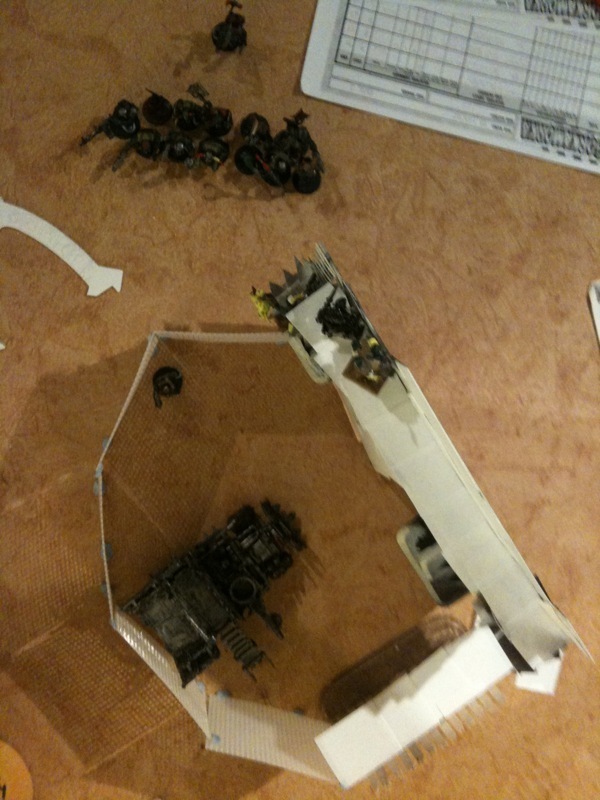 This entry was posted on Friday, November 20th, 2009 at 23:15	and is filed under Battle Reports. You can follow any responses to this entry through the RSS 2.0 feed. You can leave a response, or trackback from your own site.